We are thrilled that poet Matt Black will be working with us over the summer and into the autumn, funded by West Midlands Readers’ Network. Matt will be hosting poetry and storytelling sessions in the bookshop and down by the swimming pool/play area in Abbey Fields, and there will be other events and activities over the summer. He and Tree House bastion John Watson are even building a treehouse to go inside the Tree House, big enough for Matt to sit inside and read stories! We are launching this initiative on Saturday 30 June, from about 12.30 until about 4pm, with live music from the fabulous Hatstand Band, a cartoon drawing working (1.15pm) with artist Okse, poetry, free tea and cake, and more. We will incorporate watching the Carnival parade as it passes by at around 2.45pm. Do come and join in the fun! If you live in Kenilworth, keep your eyes open as you walk around town…we’ve released some books into the wild! You might find one on a park bench or at a bus stop or who knows where. The books are free to take, and the slip of paper encourages the reader to pass the book on when they’ve finished, or rewild it! We’d also love to hear about any finds – there is a Books in the Wild page here for reporting back. We’re raising awareness of Kenilworth Arts Festival as well as just spreading bookish fun around the town. Happy hunting, happy reading! As most of you will know by now, the recent changes I referred to a couple of blog posts ago have fallen through. Sometimes it becomes clear that things are not going to work out, and business is often a risky thing, especially on the high street. Things are unpredictable. While the recent change may have seemed a good solution to our crisis a few weeks ago, it was clearly not meant to be – and we have unexpectedly been given another chance to carry on with what we’ve always done at the Tree House: focus on building community through books and the arts. This seems a very positive thing despite the difficulties! I am meeting with the landlord on Monday, and all being well, we will carry on and the support during the last week has been fantastic – loads of books donated, and good book sales each day. We will start regular evening events again very soon, but I want to get the books sorted first – those who have been in will know that there are lots of empty shelves and books everywhere, it’s very similar to when we first opened! It is not easy running a small, independent, high street business – especially when the heart of that business is not commercial. We do need to strengthen our commercial activity, but not at the expense of the more important things – making books accessible and affordable and offering great quality cultural events to our town, bringing people together and cementing friendships. Community, for us, means sharing experiences and exploring ourselves, our humanity, our place in the word through the arts. It’s so exciting to be given another chance, however daunting the finances. We still have an imminent crisis – we have only two weeks of the month in which to raise the rent and rates, due on 1 September – that’s £1700. There is a little left in the bank from before the recent brief takeover, and we’ve had a good first week since we regained the business, but it’s going to be touch and go. However, I will do my best and there is certainly no lack of support! 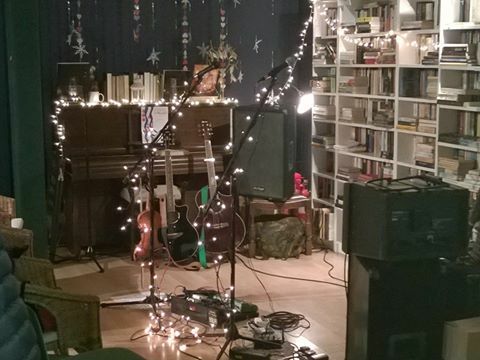 If you wish to support us with a donation, however small, we have a fundraising page; if you are local and have books you are going to get rid of, we always need donations – DVDs too; and we have a programme of amazing music and exciting performers coming up in the next few months. First up is the wonderful Mark Harrison, blues singer/guitarist and a very engaging guy, this Friday, 26 August. I know it will be a great night. Tickets are just £10, online or from the bookshop, and there are just 12 tickets remaining – see our Events and Buy Tickets tabs for more details. Live music is such an amazing experience, especially in an intimate setting such as the bookshop, so I hope you can join us. It’s not going to be easy, but life rarely is. Certainly things that are truly worthwhile rarely are. I believe we have something a bit different, something life-enhancing and even a bit magical to offer at the Tree House, and I am hoping we can take it forward and strengthen the foundations of what we have begun. I want to use the blog today to mention an excellent new online arts publishing venture. Here Comes Everyone, founded in 2012, is an online network and magazine for those in, or interested in, the arts. The founders and editors are Warwickshire-based, and are trying to connect those working in the creative arts, including writing and publishing, and giving them/us an online place to submit work and engage with the work of others. Gary and Adam, the founders, are hoping to produce hard copies of the magazine, and if/when they do, we will be selling them at the Tree House. This is a great venture, which ties in very well with what I am hoping to do – my plans are to use a physical space, theirs to use an online space, and these two things go hand in hand in our contemporary world. It’s also great to find out who is doing what, to read articles, stories and poems by people who haven’t found a published platform elsewhere, and to think about the arts and connections between them. It’s part of Silhouette Press which Gary and Adam run as a not-for-profit company (something else the Tree House shares! ), and it’s great to see this sort of project taking off. I have linked above to the About page, but you can read current and past issues of the magazine on their website – definitely worth exploring! The issues have themes – the latest issue is Dinosaurs – the previous one was Colour – the forthcoming one is Prophecy. This is a lovely and exciting venture; do go to their website to find out more. I hope we can continue to support each other as things develop both for HCE and the Tree House! Donate to support our events programme. We want to bring great live music and other events to Kenilworth, and this can be a struggle through ticket sales alone. Every donation, however small, helps!